In general finding a good balance is key to most things in life. You need to have a balance between work and play, a balance between saving and spending, and a balance between good and evil. 🙂 Just kidding on that last one, but you get the point. One place that people tend to disagree when it comes to balance is when you have debt to pay off. Most personal finance experts, like Dave Ramsey, recommend being as intense as possible when it comes to paying off debt. But, what if that is not always the best way to go about it? In general, I agree that while you are in debt, it needs to be your main financial focus. However, here are just a few ways that I think you can maintain balance with other financial goals, even while you are in debt. 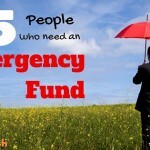 In my last post, I talked about different groups of people that should absolutely always have an emergency fund. After I penned that post, I was reminded by commenters that everyone should have an emergency fund, which is something I agree with as well. Even while you are in debt, you need to have at least a mini-emergency fund to see you through. Personally, I’ve decided to continue building my emergency fund even while I’m in debt by funneling a small, set amount into my emergency fund savings account each month. If you don’t have an emergency fund while you are trying to pay off debt, chances are you’ll end up putting any emergency that comes your way onto a credit card and you’ll severely de-rail any progress you’ll have made. Putting money toward saving for retirement while you still have debt is a pretty controversial topic because people tend to have very strong feelings about if this is the best financial decision or not. When it comes down to it, it really depends on the person and their individual financial situation as to whether or not this saving for retirement while continuing to pay off debt is a good financial decision. In general, I think saving for retirement while you still have debt is a good idea if you are earning an employer match on your retirement contributions. This match effectively doubles your money and gives you a 100% return on your investment if your employer matches dollar for dollar. That said, you need to consider the impact this can have on your debt free date and your overall budget before you decide. If you have to live off of Top Ramen© for every meal in order to pay off debt and save for retirement at the same time, it might not be a good decision. We decided to stop our retirement contributions because we felt okay being outside of investing for the short period of time (7 months) while we threw every extra dollar at debt. When you are in intense debt payoff mode, it can mean skipping things you might normally pay for in order to get out of debt more quickly. This is not a bad thing, but you do need to be smart about what you decide to skip paying for as you strive to get out of debt. There are some maintenance activities for your car or home that you might be able to skip or perform a little less frequently than usual in order to save money. Another option is to do more of these things yourself (if you can) so your car and home are still kept in good, working order, but you’ll still save some money. When we were getting out of debt, we (or Chris) started to change our own oil in our cars. We cancelled our cleaning lady and I began to repair things at home that broke instead of buying new ones. Fast forward to being debt free 4 years and we are still changing our oil, cleaning our own house, and fixing broken things around the house because we now know how and we still like saving money! Finally, one thing I absolutely wouldn’t skip paying for even if you have debt is your health. Your health is so important and you need to take care of yourself as well as you can for as little as you can while you are in debt. Keep in mind this does not mean getting your hair highlighted, getting your nails done on a regular basis, or getting a massage every month (unless prescribed by a doctor for real health reasons). These are all things that should be cut from your budget at least temporarily as you work to get out of debt. Investing in your health while you are in debt includes things like going to the doctor when you are sick, not skipping preventative health screens, and taking medication as prescribed rather than trying to skip doses to make it last longer to save money. There are lots of ways to save money so you can pay off debt more quickly, but messing around with your health is not one of them. My husband and I are trying to get out of debt by following your steps and we are coming to a disagreement on cancelling our gym memberships. He says we can work out at home and run through our neighborhood while I still want to pay for our gym membership because I feel we get a better workout at the gym. Any recommendation you could give would be great! This is a tough one because I LOVE going to the gym and our gym costs $300 per month! Yes, you guessed right – Crossfit. However, there was a way we could cut costs out our gym by me becoming a Crossfit Coach and saving 50% off membership. Depending on how big or small the gym is, ask if you can come in on the weekends and clean the gym, help out in childcare, take pics for their social media page, or even become a coach. I know we wouldn’t have paid $300/month for a gym membership when we were getting out of debt, but I think there is another option on the table that you haven’t looked into yet. Studies also show that financially successful people are related to being physically fit. I don’t think paying full price for expensive gym fees is financially smart when you’re swimming in debt, but I do think running, jumping, lifting, etc. throughout the week is going to lead to a more productive and thus better financial life. 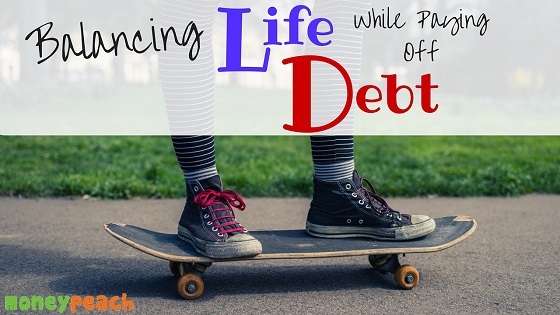 Finding balance between paying off debt and maintaining other financial goals can be difficult to navigate, and the decisions about what to pursue alongside debt repayment will vary for different people. Some will choose not to pursue anything other than debt freedom, while others will take it a little slower and maintain some of these other goals at the same time. The bottom line is that both choices are still going to help people get out of debt and improve their financial lives. Are you balancing any other financial goals along with debt repayment? We no longer have any debt aside from a very small mortgage. However, I agree with these tips! We kept our lives fairly balanced when we were paying down debt many years ago. You can’t let everything go in pursuit of debt freedom – especially your health! You are absolutely right. I’m glad you agree that some balance is necessary while you are paying off debt. Great post! I definitely agree that balance is key because life does’t stop when you are in debt. I remember when we were getting out of debt, we literally had the pedal to the metal. I was ready to start sacrificing food and water until my wife helped me realize that was, well….. stupid. We lightened up our craziness (my obsession) and soon came to a level of sacrifice we both agreed on. When we were both on the same page with EVERYTHING, the debt seemed to get wiped out even sooner! That’s exactly it! I know I would be further with my debt progress if I stopped saving for retirement a couple of years ago, but I didn’t want to lose out on the employer match. It’s free money! I struggled with this when I came up with a repayment plan for my student loans. To date, I owe $29k in loans but my interest on them is 2.70%. At the same time, we are saving up for down payment for our first house. I could go 100% towards my loans and then worry about down payment later. However, I’m missing out time and opportunity. I finally settled on a 3 year repayment plan for my loans AND saving up the rest for down payment. I think this works for us at this time. That’s great Jaymee! It sounds like you found a good balance for your financial priorities. That is a great interest rate on your student loan too – wow!